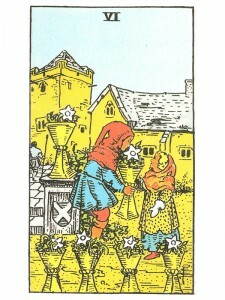 Six of Cups says you are experiencing the presence of healing, revitalizing, renewing, regenerating emotional pleasure. Happiness will come from past memories. A new relationship and environment is now possible – you will experience the harmony of natural forces without effort or strain. A chance to relocate, a new job offer, new friends who will have much in common – an inheritance that will bring surprises. You will experience the exchange of love and pleasure that two people can bring to each other. Take advantage of your opportunities to let dear ones know how you feel – do not hold back. You are a romantic who will always fall for the hearts-and-flowers routine, you enjoy being showered with love and you are hungry for tender words and a caring touch. Benevolent emotions, dreams, sweet memories – warm, secure feelings that help you face current problems. Giving and receiving – the teacher or protector gives wisdom and security to the student, friend or family member. Here are the feelings of love and respect, caring involvement in the emotional and creative affairs of those closest to you, especially the family. The level of the sixes teaches the necessity for expansion beyond the self, not only into our blood relatives, but into the broader range of an extended family with which we can share the close emotions formerly reserved only for our bloodline. Good memories of the sort only intimacy, interdependence and time well spent can bring. Emotional and creative generosity, self-sacrifice. Sincerity, good manners, charm, compliments, sincere flattery, sympathy/empathy. Work, professions relying on these qualities. Emotional recognition. What insight or awareness have they provided? Next to Moon: You hold concerns from some misunderstanding in the past – see the situation realistically and put it to rest. Next to Strength: You can achieve your goals – old dreams can become new, shiny, attainable ideas. Next to Hierophant, Emperor or Empress: A Karmic lesson must be understood and corrected. A meaningful relationship is clouded with misunderstanding or lack of tolerance. In the first position: The progress made in your Emotional Plane will allow you to practice the lessons of emotional generosity. The people closest to you will be the primary beneficiaries. In the second position: Your having participated in the lessons of emotional/creative give and take have prepared you for the unpredictable in your Physical/material Plane. You and your extended family will cover each other’s bases in time of need. Your reserves include the time and energy available in your family storehouse. In the third position: Balanced giving and/or receiving in your Emotional/creative Plane are most important now. Your circumstances probably make it fairly obvious which you need to consider most. If not, the reading is dedicated to this subject and will shed the necessary light that you need. In the fourth position: You desire most of all to have the energy and emotional means to provide love and care to those most important to you. While this sounds like good old – fashioned mothering, here the difference is this love and care you desire is a step removed from the ego. These people do not have to be your children or your family. For example: This could be the motivation that leads a person to become a director of a shelter for abused women and children. In the fifth position: You are already aware that you are in an expansion of your capacity for loving care, for healing and all the affairs of the Emotional/creative Plane. Whether you have been helping others or have accepted help from others, you will have advanced in the cause of your emotional path. You are mentally on top of these emotional matters. In the sixth position: In the near future there is an act, or a wave, of emotional generosity that reverberates through your life and/or the lives of your loved ones. In the seventh position: There will be a new level of familial interaction and caring that you must integrate into your personal activities and goals. In the eighth position: Emotional contributions to the physical situation bring about a marked improvement. This can range from something as light – hearted as your brightening up a social occasion to your making someone feel better. In the ninth position: You are warmed by the glow of healthy love that surrounds you and to which you contribute your fair share. The feelings here are open and sincere. You are becoming one with these people and your commitment will be lasting. They are to be a part of you now. In the tenth position: A situation requiring balanced giving and/or receiving in your Emotional/creative Plane will arise and be most important in the near future. Your circumstances should make it clear which is the case – if not, the reading will shed the necessary light that you need. Always a joy when a message “hits home”! You are very welcome! VERY VERY Good Diane!!! Excellent!!! You hit it RIGHT on!!!! Thank you so much!! Put tears in my eyes to hear the truth that I have been so unwilling to accept. The 6 of Cups in the 9th position tells me your hopes and desires are for the “happy ever-after” scenario. The three Major cards in position 5, 6 and 10 tell me you will have much spiritual help in achieving that goal, if you can just let go of your past – shown as the 8 of cups which is currently holding you back. I did a reading on what the future holds for me…. and I got this card in the #9 position. I can’t for the life of me figure out what it means! Here is the rest of the reading in the 10 card spread: #1 King of cups #2 Four of pentacles #3 Queen of cups #4 Eight of cups #5 The Star #6 Death #7 Page of wands #8 Four of wands #9 Six of cups #10 Wheel of fortune. Can you help fiure this reading out?